Humanist & Secularist Liberal Democrats is for all Liberal Democrats, of all faiths and none, who seek an end to privilege and discrimination based on religion or belief, and believe in a humane and evidence-based approach to public ethical issues. We are an Associated Organisation within the party, and are affiliated to both the British Humanist Association and the National Secular Society. HSLD warmly welcomes the announcement on 2 April of a government plan to require local authorities to create a register of children who are being educated outside of mainstream education. The creation of a register will help local authorities to detect cases where children are receiving a wholly religious education, attending an unregistered school or not receiving an education at all. Our Fringe event on "Is openness on your religion or belief and your sexuality a barrier to political office?" Liberals believe in the right to be open about your personal religion or belief and your sexuality - but also the right to keep them private. We'll be exploring whether pressure to disclose your beliefs or sexuality deters people from public life. 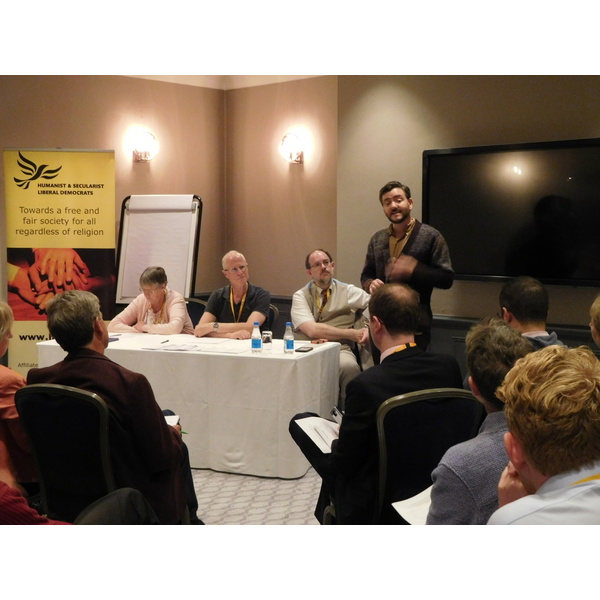 Autumn Conference 2018 in Brighton saw three important wins for humanist-secularist principles in Lib Dem policy. HSLD was delighted to see three of its proposed amendments to policy motions adopted. and that our party's policy on caste discrimination is reaffirmed at a time when the government intends to scrap legislation on caste discrimination that was introduced by the coalition government. 1. To a motion on Immigration and Identity, we supported an amendment that ensures that party policy on reviewing how asylum rules affect various groups - including Christians and LGBT+ people - also includes those who flee their country of origin because of persecution for their religious or non-religious belief. HSLD was pleased to work with Lib Dems for Seekers of Sanctuary on this amendment: having ascertained that both groups were submitting similar amendments, we withdrew ours and backed theirs. 2. To a motion on Britain at the heart of a changing world, we submitted and saw passed an amendment that ensures that the party's commitment to protect, defend and promote human rights for all specifically includes the rights of those persecuted for religion or belief. 3. And finally, to a motion on Liberal Democrat Priorities for a Better Britain, we submitted and saw passed an amendment ensuring that caste, religion and belief are all specifically mentioned as characteristics that should be regarded when thinking about the application of equal opportunities for all. Humanists UK Chief Executive Andrew Copson was the entertaining and thought-provoking guest speaker at our AGM at the Brighton Conference. His talk on The Global War on the Non-Religious gave a chilling account of the growing threat from intolerance, yet delivered with a wit and panache that demonstrated all that's best about free thought. 9.1.1 While we recognise the rights of parents to choose how their children are educated we believe there is a need for greater supervision of those children who are educated outside registered schools. There have been cases of children who have come to serious harm while invisible to the system because they were being home schooled. The number of such cases is small, and we would not want to see the vast majority of parents who home school their children extremely well put to great inconvenience, but we believe there is a duty to ensure the safety of such children. A. Religious communities make a valuable contribution to the cultural life of the UK, and religious organisations have played a major historic role in broadening access to education. B. Children should not be taught to hold or to reject religious or non-religious beliefs against the wishes of their parents, and religious instruction should not be funded by the state.